Since ancient times, heola have served the world of Tamarra by becoming Protectors of something they choose – land, folk, or even an idea. Here Aktil Na Baylarrasa, a long-lived and well-travelled martle, shares his encounter in the Suong Mountains with Drammar, a heolas Protector of the Land. In the year SP~4,988*, my journey took me to the Suong Mountains, in the far southwestern corner of the Tamarran Continent. These lands are dry and hot, with little vegetation. Nestled among the twisted chains of long cordillera, the ranges of the mountain, are many high, flat shelves. These are usually small, measuring at most a few miles in length and typically far less in width. It is on one of these shelves that I found safety from a band of goblins that had been following me for days. Many of these evil creatures infest the Suong Mountains. They have built their own kingdoms within the mountains and claim parts of them as their own. Here I encountered Drammar, the heolas who served as Protector of this land of Suong Mara, nestled between two high peaks. Not knowing which languages this heolas spoke, and since I know many, as is the custom for my folk, I chose to speak in the native tongue of the heola, Sahan. “Greetings, heolas of the mountain. I am the martle named Aktil Na Baylarassa.” I held out my hands in recognition and bowed slightly. Drammar also bowed, saying, “Greetings, martle. You and your cousins are known to me and my folk. I welcome you here if you come without harm in your mind.” I was struck that Drammar knew the reference, “you and your cousins”. Most do not understand that we, martles, refer to ourselves in this way. We are cousins to each martle and each of them to us, even to our ancestors. I could see from Drammar’s bearing, firm but polite, that this heolas was a Protector, one of those those known as Lesaneth. “I come here to seek shelter and, in return, I would bring what aid I might to you and the this place that you Protect, if you are indeed a follower of Lesaneth.” It was the proper greeting, and I could see that Drammar recognized it as such. As Drammar finished speaking I heard a sharp sound of barks and squeals – clearly the sound of goblins, no doubt those that had been following me. There were a number of goblin voices, and they were close. Drammar did not have time to lead us to a safe place before a band of perhaps a dozen goblins appeared, slouching their way out from behind an outcropping of the mountainside. The lead goblin hesitated, seeming to assess the situation. As vile as these creatures are, they are surprisingly rational when it comes to war and fighting and do not often make mistakes. After its momentary calculation, it clearly arrived at a decision. He screeched a loud, intimidating reply as he and his cohort, lunged at us. 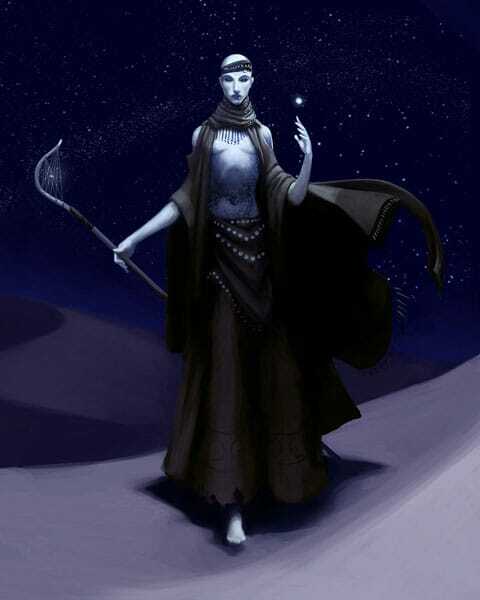 I reached for my knife, but before I could touch it, I heard a soft incantation from Drammar, whose long, sand-brown cloak billowed up and swept back as a swirl of sand and dirt rose up from the ground in front. A wall of earth suddenly spun before us, higher than our heads and as wide as the band of goblins that faced us. It sounded as if a caravan of wagons was crashing down a ravine. The last thing I saw of the goblins before they were wholly consumed by this powerful storm was the look of shock on their faces. Then, with one more spoken word and a pushing motion, Drammar sent the storm careening into the goblins, carrying them far back into the ravine from which they had appeared. The wind dissipated, and Drammar’s cloak settled into stillness. We both listened for a minute and heard the sound of many goblin feet heading down the mountain away from Suong Mara. It was the first time I had witnessed the fury of a Lesaneth protecting their land, though it would not be the last. Drammar and I enjoyed a delightful feast and much conversation. * The current year is SP~5,019.